A friend of mine, an art critic and historian, once told me: "These days it's not fashionable to read in". Meaning, critics try not to dwell on or decipher the symbolism of the subject matter. Somerset Maugam, the English novelist, has pages and pages where he 'reads into' art, music and literature. They show how much we've lost when it became 'unfashionable'. Here is a wonderful passage from Christmas Holiday, a 1939 novel, in which an Englishman, who thinks of himself as an expert in art, is given a lesson in how to really appreciate paintings by a young Russian emigré. There is a mystery here. 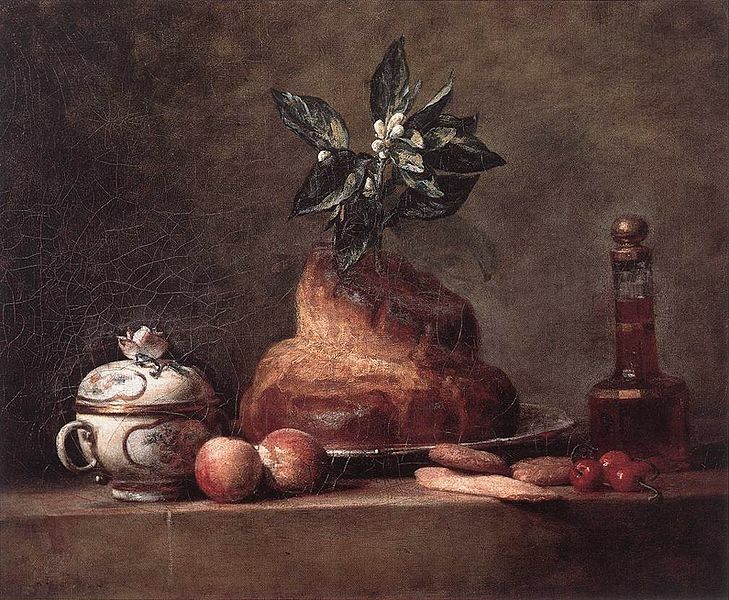 Chardin's still life (above, reproduction from here) fits the text of the novel best but the original painting is in the Lille museum of fine art, not in Paris. The only still life in the Louvre (below, from here), that I could find, doesn't quite fit the bill. If you know of other still lifes by Chardin that fit Maugham's description, please let me know. "All right. You take me and show me the pictures you like." The position was reversed. It was not he, as he had expected, who was leading the way and with such information as would add interest to the respective canvases, sympathetically drawing her attention to the great masterpieces he had always cared for; but it was she who was conducting him. Very well. He was quite ready to put himself in her hands and see what it was all about. "Of course," he said to himself, "she's Russian. One has to make allowances for that." 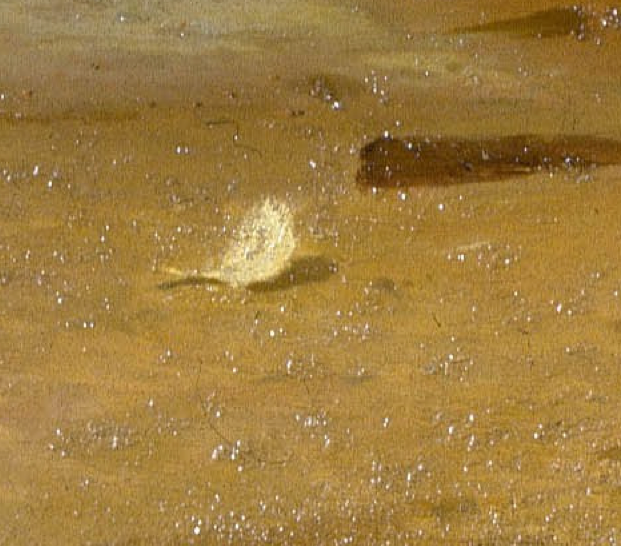 They trudged past acres of canvas, through one room after another, for Lydia had some difficulty in finding her way; but finally she stopped him in front of a small picture that you might easily have missed if you had not been looking for it. "Chardin," he said. "Yes, I've seen that before." "But have you ever looked at it?" "Oh, yes. Chardin wasn't half a bad painter in his way. My mother thinks a lot of him. I've always rather liked his still lifes myself." "Is that all it means to you? It breaks my heart." "That?" cried Charley with astonishment. "A loaf of bread and a flagon of wine? Of course it's very well painted." "Yes, you're right; it's very well painted; it's painted with pity and love. It's not only a loaf of bread and a flagon of wine; it's the bread of life and the blood of Christ, but not held back from those who starve and thirst for them and doled out by priests on stated occasions; it's the daily fare of suffering men and women. It's so humble, so natural, so friendly; it's the bread and wine of the poor who ask no more than that they should be left in peace, allowed to work and eat their simple food in freedom. It's the cry of the despised and rejected. It tells you that whatever their sins men at heart are good. That loaf of bread and that flagon of wine are symbols of the joys and sorrows of the meek and lowly. They ask for your mercy and your affection; they tell you that they're of the same flesh and blood as you. They tell you that life is short and hard and the grave is cold and lonely. It's not only a loaf of bread and a flagon of wine; it's the mystery of man's lot on earth, his craving for a little friendship and a little love, the humility of his resignation when he sees that even they must be denied him." Lydia's voice was tremulous and now the tears flowed from her eyes. She brushed them away impatiently. "And isn't it wonderful that with those simple objects, with his painter's exquisite sensibility, moved by the charity in his heart, that funny, dear old man should have made something so beautiful that it breaks you? It was as though, unconsciously perhaps, hardly knowing what he was doing, he wanted to show you that if you only have enough love, if you only have enough sympathy, out of pain and distress and unkindness, out of all the evil of the world, you can create beauty." She was silent and for long stood looking at the little picture. Charley looked at it too, but with perplexity. It was a very good picture; he hadn't really given it more than a glance before, and he was glad Lydia had drawn his attention to it; in some odd way it was rather moving; but of course he could never have seen in it all she saw. Strange, unstable woman! It was rather embarrassing that she should cry in a public gallery; they did put you in an awkward position, these Russians; but who would have thought a picture could affect anyone like that? He remembered his mother's story of how a student friend of his grandfather's had fainted when he first saw the Odalisque of Ingres; but that was away back in the nineteenth century, they were very romantic and emotional in those days. Lydia turned to him with a sunny smile on her lips. It disconcerted him to see with what suddenness she could go from tears to laughter. "Shall we go now?" she said. "But don't you want to see any more pictures?" "Why? I've seen one. I feel happy and peaceful. What could I get if I saw another?" It seemed a very odd way of doing a picture gallery.